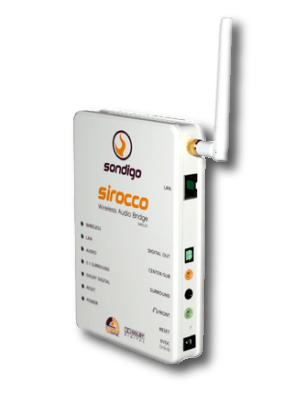 Sirocco Wireless Audio Bridge from Sondigo is a wireless sound card that allows users to stream any audio, songs, music (MP3 included) from PC or notebook, to anywhere in the house wirelessly. Sirocco Wireless Audio Bridge features audiophile-grade lossless transmission, pure digital optical output, and ability to sidesteps all DRM and content protection issues. The 802.11 Wireless LAN technology based Audio Bridge is 100% Compatible with all PC audio formats from disk-based media files or streaming contents or Internet radio or game audio or DVD movie audio, with or without DRM protection scheme. Sirocco also supports 5.1 channels of audio, with Dolby Digital through a single optical connection, or through the multichannel analog outputs.